It was 1966. Careening off the road, the bus ran through a field right towards my car and me. I had no warning—never heard it coming. In 1971, still in pain despite many trips to rehabilitation centers and MDs, I finally heard about doctors of chiropractic (DCs). The doctor said, “What that bus did was to twist your whole body to the left. I need to restore you back to standing straight again.” And chiropractic did. By 1978, I was married. Should I return to school? Years ago I had been a student at Duke University Medical College. Now, of course, it was to be Logan College of Chiropractic. This did not change my respect for modern medicine but it was chiropractic that changed my life. That classes were identical to those at medical college. Of course rather than learning how to feed our patients pharmaceuticals, chiropractic students quickly learn how to work with the bio-mechanics of the body in a natural way. After the first two years of chemistry, physiology, anatomy, embryology and so forth, our classes in chiropractic adjusting began. The first time that I was able to put my precise and superb training to use was in the classroom setting where we were to gently and accurately place our hands on a class partner. I realized at that moment that I had been created to do this immensely important work. I had never felt so naturally comfortable at anything I had ever done before. As the intense years of training went on, my supervised work in the clinic brought satisfaction. But there’s another story I must also tell. In 1981, my one-year old son was injured. He survived the injury but his eyes became dim, and at that age of furious growth, he was actually losing weight. It wasn’t until three months later we met Dr. Reiss, a DC and a craniopath. “What is a craniopath,” you ask? After taking a careful history and doing a proper examination, Dr. Reiss spoke with us at some length and explained that our son’s head (his cranium) had been hit pretty hard. Now understand that the bones of the head are not like a solid rock. They have a tiny but important movement even under normal circumstances. Dr. Reiss placed his hands very gently on the boy. Dr. Reiss didn’t do anything. He waited for that natural, little movement which he then controlled. Our son returned to normal on the spot. His eyes lit up like normally excited eyes. By three months later, he had gained enough weight to be at the normal weight for a child his age and height. I dedicated my remaining years of training to studying craniopathy and its base of Sacro Occipital Technique with this doctor and his mentor, Dr. Bertrand De Jarnette, DC, who became my mentor as well. 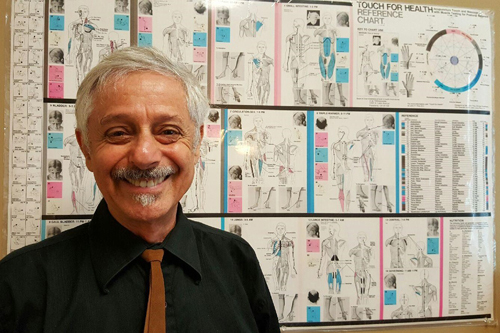 Along the way I was also offered the opportunity to become certified in acupuncture and Cranio Sacral Therapy, which I felt could only enhance the benefits that I could extend to my patients. Nowadays my practice is dedicated to bringing all my knowledge to bear in moving my community and its individuals into the best of health. We do this through extensive consultations and examinations in order to allow the patient time to collaborate with us and find the direction where we need to move together to accomplish this purpose. As a result of this, I find that the age or health condition of the patient is not an issue. Everyone has the opportunity to achieve great health. The role of the chiropractor is to remove obstacles, so that the patient can do the healing. All humans have the ability to heal—to dissolve obstacles—to restore wellness. I do my best to continue learning—to work with zeal, hoping to bring about my and my patient’s collaborative end goal. Sometimes I just stop and sit for a moment to feel my sense of gratefulness. I am blessed to have found this place in my life. Serving patients in Hillsborough, I have been here since 1994 with my children and previous wife, Saura Bartner, who died in 2003. I then retired to write, and to work with the community in other healing ways. It was hard to imagine my loving again, but years later, was beautifully guided to meet Liz after being convinced by my friends to go to a contra dance. Now married to Liz Gilson Aaron, our love outside the Health Center is to continue the building of our passive solar “1909 Mill House” right up in Hillsborough surrounded by organic vegetable, fruit and flower gardens, chickens and guineas. How often do I receive chiropractic care? Remember I was hit by a bus! From 1966-1971 there was little or no help—hours and hours of treatment still leaving me in pain. Now I have five minutes of chiropractic on the average once a week—and I am well. Being essentially out of pain, I wouldn’t care if I were treated every day. It is worth it to be out of pain most every day and give thanks. I can do heavy gardening, strenuous workouts, housework, plumbing and carpentry. Part of chiropractic is food—good food. The Health Center teaches preparation of health-giving foods. Join us for a free meal—our children do—our children love chiropractic in all its forms, utilizing natural approaches to health, pain relief and wellness. Thanks for visiting our site. I look forward to meeting you in person and learning how we may be of service to you. Give our Hillsborough office a call, or send me an email and let’s arrange a time to explore your options.